At Pine Street Inn, we’re often categorized as an emergency shelter. And that’s true – we provide beds for hundreds of homeless individuals each evening who need a place to stay. But like the other service providers in the Coalition for Homeless Individuals, we’re working diligently to change the trajectory of homelessness. Using that goal, Pine Street Inn has undergone a transformation over the last few years to provide more and more permanent housing beds. Like the rest of our coalition members, we’re committed to the Housing First Initiative and are targeting those who have been homeless for the longest period of time so that we can ensure stability as our dedicated staff work to end the root causes of homelessness. As the chart below demonstrates, we have shifted our structure. 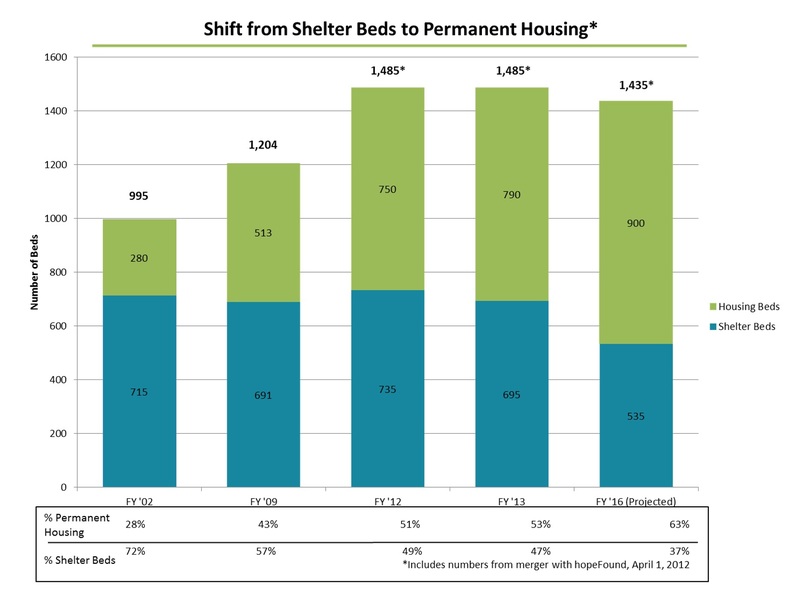 More than half of our beds are now in permanent housing. Homelessness is a cycle, which perpetually circles back to the use of expensive emergency services across the state. At Pine Street Inn, we’re working to break that cycle by moving men and women out of shelter, off the street and into housing. Not only does this ensure a much improved quality of life, it also saves in emergency health and public safety costs.